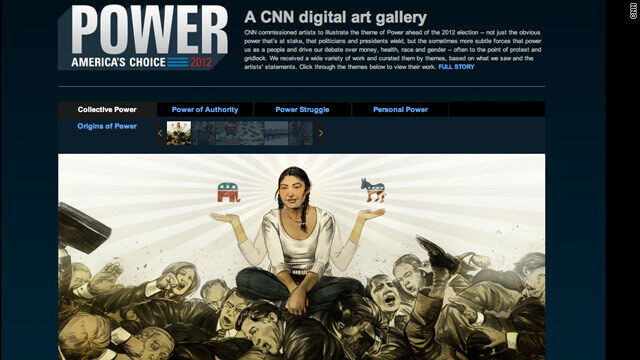 CNN Digital has commissioned more than 20 artists to interpret the theme of “Power” as it relates to politics and this election season. Their pieces were submitted through a variety of mediums, including drawings, sculpture, cartoons, photos, video and more. The digital art gallery is divided into categories that explore various aspects of power – the origins of power, power struggles and the power of authority. The idea behind “Power” is for users to explore the gallery, take time to interpret and analyze works of art, and hopefully elevate the conversation around politics and elections beyond the news of the day. This is the second digital art gallery that CNN Digital has commissioned. The first, “Ripple”, was produced for the 10th anniversary of September 11.